According to a report published this month by Physicians for Human Rights, the healthcare system in eastern Aleppo has been destroyed by government attacks on the city. Syria Deeply spoke with one of the report’s researchers to find out more about how healthcare workers are coping with the crisis. BEIRUT – The Syrian government has “decimated” the health care system in eastern Aleppo, according to a report released this month by Physicians for Human Rights (PHR). In the past three years, the rebel-held half of Syria’s northernmost city has suffered 45 direct government attacks on healthcare facilities. More than two-thirds of the area’s hospitals no longer function and approximately 95 percent of doctors have fled, been killed or detained, according to the report. The assortment of doctors and nurses that remain – roughly 60 to 80 doctors and 200 nurses that work on a rotating basis – are forced to work jobs far afield from their original area of expertise. 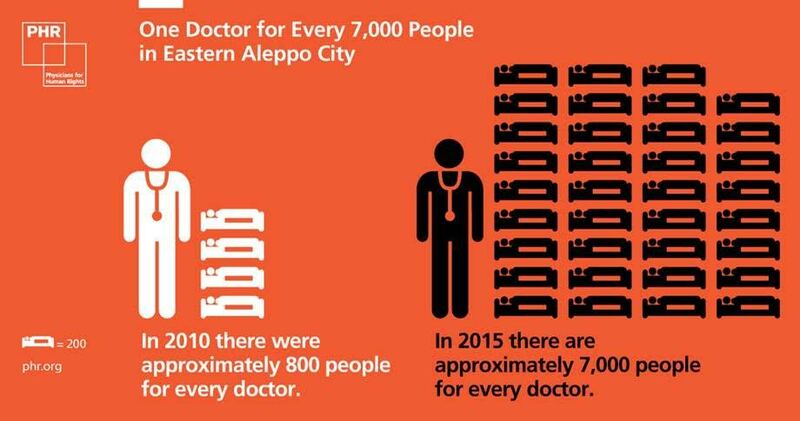 During a two-week period in July 2015, PHR researchers interviewed 24 physicians and other health professions working in the 10 remaining hospitals – there were 33 functioning in 2010 – in eastern Aleppo. Entitled, Aleppo Abandoned: A Case Study on Health Care in Syria, the report details how healthcare workers have managed despite limited access to equipment, medication, supplies and trained staff. Syria Deeply spoke with Heisler shortly after the report was published to find out PHR’s methodology and the current state of affairs for health providers in eastern Aleppo. Syria Deeply: One of the headlines of the report states that in eastern Aleppo less than a third of the hospitals are functioning, 95 percent of the doctors have fled, been detained or have been killed, so who is left to run the healthcare system there? Dr. Michel Heisler: There is a core of pretty phenomenal physicians and other health professionals maintaining services in the area. As you can imagine – although if you look at the whole report, I think the largest hospital at any one time has about 13 physicians – a lot of the medical care has been task-shifted. And you can imagine although if you look at the whole report, I think the largest hospital at any one time has about 13 physicians, but a lot of the medical care has been task-shifted. They’ve been remarkably resilient. There are still three functioning dialysis units in eastern Aleppo, but there are absolutely no kidney doctors, so all of the dialysis units are staffed by technicians and they’ve worked out very ingenious ways of making the best of what they have in terms of equipment. There is a very small core of surgeons and physicians. Almost all of the physicians we spoke to had been pediatricians, and are now basically working in emergency medicine, actually doing residencies to learn how to do surgery. You have people that are trained in one field having to learn on the job how to provide care in another field … You have general surgeons working as vascular surgeons – there’s a terrible scarcity of vascular surgeons. As one physician said: “We’re able to save lives but many legs are being amputated that wouldn’t have to be if we had more vascular surgeons.” There are currently no functioning CT scans or MRIs in the city, so that’s especially problematic. As you can imagine, with all the barrel bombs and the air attacks, a lot of people are incurring traumatic brain injuries. Without a CT scan or an MRI, you really can’t do brain surgery. We actually have some neurosurgeons in the city but you really can’t … a lot of people are dying because they can’t image the brain, and without the imaging, they can’t really go in and figure out how to help them. So it’s a lot of improvisation, and an unbelievable amount heroism, certainly. A lot of the doctors we spoke to, all of their families are already in Germany or in Europe. Their families are begging them to leave Aleppo. Many of the physicians have transferred their families to Gaziantep or other places in southern Turkey. The physicians basically go to Aleppo for 15 to 20 days, they stay at the hospital in part because it’s too dangerous to go back and forth with the barrel bombs, so they kind of work 24/7 for 15 to 20 days, and then they go and just collapse and rest in Turkey. They realize that they really need to give themselves periods of rest otherwise they’ll get burnt out, they’ll get demoralized – and actually one physician said that, without the breaks, they become less empathetic doctors. They are just very matter of fact. The humility is remarkable. I mean, everyone we talk to, we’re all like, “Wow how can you do this?,” and they’re like, “How can I not do this? I’m a doctor and this is my city.” There are still about 400,000 civilians in eastern Aleppo. As one ophthalmologist said: “You know, if I leave, if someone has a foreign object in their eye, they wont have anyone to help them.” And they’re aware in the midst of barrel bombs, there are not going to be new physicians coming. So basically this is the group of doctors that is trying to hold steady to provide medical care. Syria Deeply: How have national and international aid organizations helped to fill the gaps in coverage when it comes to supplies and personnel? Dr. Michel Heisler: We went into this thinking they’re going to talk about shortages and lack of medicine, but pretty much all the physicians said the first and the last thing they need is safety. As one physician said: If you can’t protect your staff, if the hospitals are being bombed, then it doesn’t matter if you have medicine. Syria Deeply: Who is responsible for targeting these medical facilities in the eastern area of the city? Dr. Michel Heisler: The Syrian government has hit over 95 percent of them. And again, they have airplanes so the air strikes are coming from the Syrian government. They are systematic attacks, certainly some of them are deliberate attacks, certainly some of them also with barrel bombs. You know if they drop a bomb on a school or a mosque or a civilian structure then there are times that the hospital is affected by the blast. PHR has adopted a very rigorous methodology requiring corroboration from different independent sources. I think at the very beginning of our interviews, PHR thought maybe these strikes are all a result of collateral damage. However, a couple of things argue against that. First, most of the major hospitals stand alone. They’re not near any buildings that could be a legitimate military target. I will also emphasize the hospitals are still in the same place as they’ve always been. It would kind of be like our government not knowing where Mass General is. They very much have started trying to move their procedures and operations into the basements to protect themselves from the bombs. They’ve tried to keep the lights off to protect themselves from the bombs. PHR also obtained satellite imagery of just before the attack and just after the attack, and that allowed for it to rule out claims that there may have been a legitimate military target in the vicinity at the time. Again, these hospitals are all in the city, they are not on the front lines. These are in civilian areas. There are very compelling reasons to believe that both doctors and hospitals are being targeted, and that this is being used as a weapon of war to terrorize civilians. And, I’m sure, to deplete civilians living in eastern Aleppo. The other circumstantial evidence is that many of the hospitals have been hit more than once. Syria Deeply: You were quoted as saying that the Syrian government is using the attacks against Aleppo’s health care system as a weapon of war. Dr. Michel Heisler: One of the points that we’re trying to really get across is that unfortunately, and as tragic as this is the case, a lot of people chalk it up to chaos and collateral damage. If there is not mobilization against this in the way that there was mobilization against the Syrian government’s use of sarin gas against its own civilians in 2013, then this will become a standard weapon of war. It is an insidiously effective weapon – to sow fear. I mean, you’re attacking safe spaces where wounded people and ill people are going to be healed, and where people have made an oath to heal them. When these places are directly targeted – that’s a devastatingly effective weapon of war.